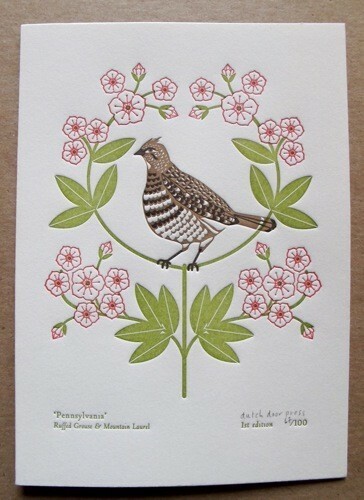 Aren't these letterpress prints of state birds and flowers from Dutch Door Press stunning? I don't think I can resist buying up the Pennsylvania and North Carolina prints for our new apartment...a little spin on the state plates idea we displayed at our wedding. Maybe, for fun, I'll get our current state too...so pretty! Did you grow up knowing your state bird and state flower? My mom made sure this information was covered in our homeschool repertoire. I've never seen the Ruffled Grouse look so good as in the PA print, but I must say I'm not exactly partial to Mountain Laurel and I'm a little jealous that New Hampshire gets to claim Lilac as their state flower...it's my absolute fave.